↑ Morton, Julia F (1987). 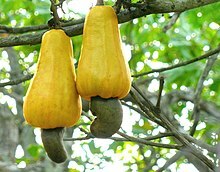 "Cashew apple, Anacardium occidentale L." Fruits of warm climates, Julia F. Morton. Center for New Crops & Plant Products, Department of Horticulture and Landscape Architecture, Purdue University, W. Lafayette, IN. पप. 239–240. ISBN 978-0-9610184-1-2. पहुँचतिथी 1 August 2016.